We're always looking for stories to share. This is an open community and all points of view are respected and valued. There are many ways to contribute to this community - and if you think of a new one we'd love to hear it! Team members make a commitment to the philosophy and goals of the community and devote the most time / effort to it's growth. They have their own blog on our site and use it to post content original to the site at least twice a month. They also have access to post / comment as our Facebook page. They are added to the "Meet the Team" page and are given a List.ly list of articles posted on their home blog for added exposure. They will also be able to list any written materials that they have for sale in our "Store" section. We also welcome bloggers and writers who would like to write original content on a part-time basis. Contributor posts can be featured on our site and promoted via our social networks sites (Facebook, Twitter, Google+). We're especially looking for people to contribute to the discussion of our monthly focus. One of the main goals of our community is to share stories that would not normally be heard. If you're a parent or caregiver of an adult who has Down syndrome and not a writer, we can help! We can do interviews (live or privately) and help convert your story for online sharing. We ALL have a story to tell - even if you don't think you do! Send us a picture or video of a person who has Down syndrome and we'll share it in our Photo Gallery or Video Gallery. Everyone can contribute to the conversation by using the forums on our site. Comment on existing topics or create your own! 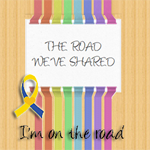 Know something that would help other caregivers/parents that we don't have listed? Let us know! Is there a local issue / news report that we should share with the larger community? We'd love to hear about it and help in any way we can! Let us know if you're ready to share! 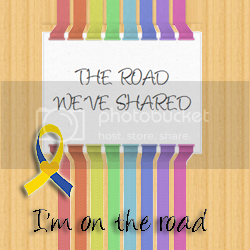 Place this badge on your website or blog to show you're "on the road" with us! Copy and paste the code to get your badge!